A2600 Dragster (USA) in 00:08.49 by Omnigamer. The game is well known as having the first console speedrun with the world record of 5.51 by Todd Rogers in 1982 according to Twin Galaxies. This record is known as the oldest, unbeaten world record in all of speedrunning. Omnigamer decided to try and match the elusive 5.51, and disassembled the entire game looking for how the 5.51 was achieved. After conducting his research, Omnigamer found that the long sought 5.51 was impossible to achieve within the conditions of the game, putting into doubt the veracity of the record of Todd Rogers. 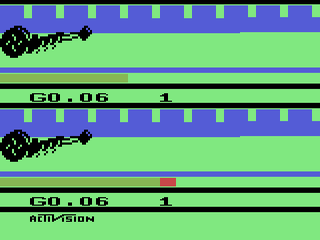 Instead, this run achieves the fastest possible time of 5.57 on player one, with player two completing the track in the lowest amount of input frames.